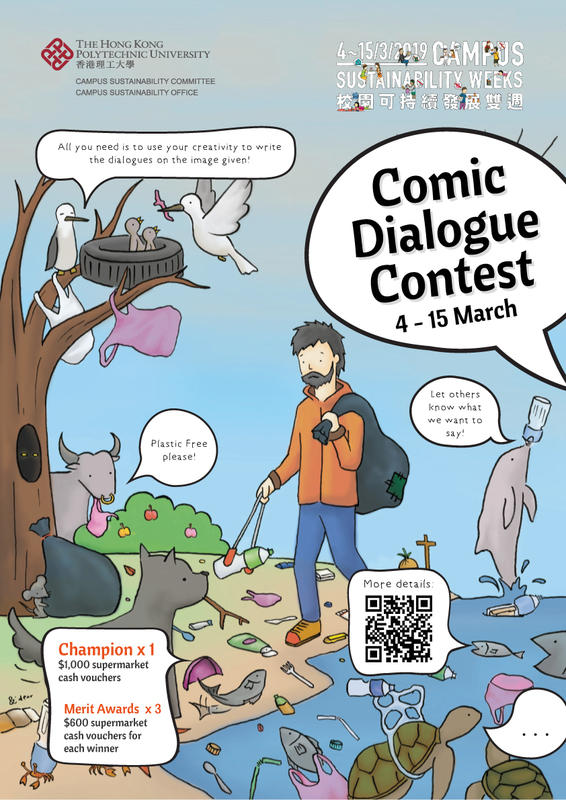 The Campus Sustainability Committee (CSC) and Campus Sustainability Office (CSO) are hosting a Comic Dialogue Contest to deepen the awareness towards and to promote the reduction of plastic use on campus! We will provide you with an illustration image, and all you need is to use your creativity to write the dialogues on it! Submit (Click here) Submit your work between 4 to 15 March 2019 to be in the chance of winning some attractive prizes! The Contest is open to all current PolyU staff and students. Simply create your dialogues with reference to the illustration image given. You can overlay the dialogues on the image by creating dialogue bubbles/speech balloons, or type them at the side with the help of some common drawing tools or editing software like PDF Writer or Paint. You need to type at least one (1) dialogue entry, and we are happy to see more. All dialogues must be in English and fit well with the context of the illustration image. Only one (1) entry will be accepted per person. They should login with their NetID to Submit submit	their works and provide all necessary contact information. Applicants cannot make any alternations or changes on the illustration image. Applicants should type (and not by handwriting) to show the dialogues on the image. All the dialogues must be in English, and be relevant to the context/theme of the image and its messages. The interpretation and decisions of the Organizer in all matters relating to this Contest shall be final and binding on all parties concerned. The Organizers reserve the rights to edit, adapt, and make alternations to the winning entries for promotion purpose in the future. Winning results will be announced on website by April 2019 and winners will be notified by email individually. Decision of the judging panel will determine winners of the Champion and Merit Awards. The Comic Dialogue Contest 2019 (hereafter "Contest") is jointly organized by the Campus Sustainability Committee and the Campus Sustainability Office (hereafter "Organizers") of The Hong Kong Polytechnic University (hereafter "PolyU"). By joining the Contest, all participants agree to comply with all contest requirements and rules, and will be deemed to be bound by the Terms and Conditions contained hereinafter. The Organizers reserve the right to exclude or disqualify any entry from the Contest at any time if any or all of these rules, requirements or conditions are not complied with. The interpretation and decision of the Organizers in all matters relating to this Contest shall be final and binding on all parties concerned. The Organizers reserve the full discretion, including the right to alter the Contest schedule, postpone, suspend, change or cancel the Contest without prior notice. The Organizers reserve the right to interpret and amend the Contest Terms and Conditions without making any advance announcement. Decision made by the panel of judges shall be final and conclusive. The Organizers reserve the right not to award a prize if the standard of the submissions does not meet the requirements at the exclusive discretion of the judging panel. The Organizers may publish/update the relevant information or news in association with this Contest on website without further notice. The Contest is open to all current PolyU registered students (part-time or full-time, undergraduate, postgraduate or research) and current teaching or non-teaching PolyU staff. The Participants should produce identity document to prove eligibility upon request by the Organizers. Members of the Campus Sustainability Office as well as the judging panel are not eligible to join the Contest. The Organizers have the final decision on the eligibility of the participants. The participants should create dialogues with reference to the illustration image given by the Organizers, which can be downloaded here. Participants can overlay the dialogues on the image by creating dialogue bubbles/speech balloons, or type them at the side with the help of some common drawing tools or editing software like PDF Writer or Paint. The participants must not exercise any alternation to the illustration image. All entries must comply with the submission requirements and formats as stated below, failing which, the Organizers reserve the right to disqualify the participant(s) at any stage of the Contest and will not be held liable for submissions received. The participants must base on the illustration image provided by the Organizers here to create the dialogues. The participants must create/type at least one (1) dialogue. The dialogues should be typed on the illustration image. No handwriting will be accepted. All the dialogues must be in English, and be relevant to the context/theme of the image and its messages. There is no word limit to each dialogue entry. The dialogues should be expressive in text and must not contain emoji or trademarks. The dialogues should not be or include elements, distinctive features, or wordings for which the participant does not have the licence and for which he/she cannot provide a licence to use, publish, or reproduce. 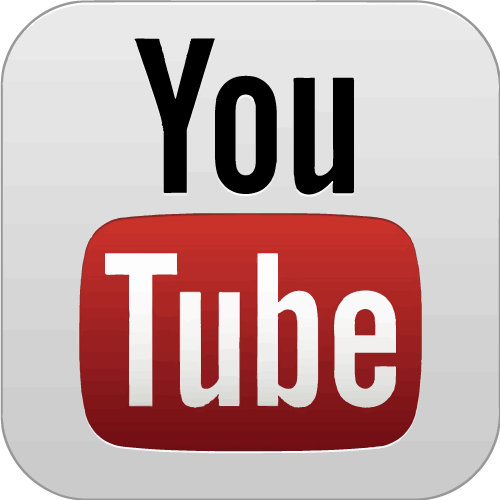 The dialogues should contain no pornographic, violent, morally objectionable element/text or promotion of commercial interests, and are not defamatory, threatening, illegal, obscene, indecent, seditious, offensive, unlawful or liable to incite racial hatred or discrimination. Entries should not infringe on the rights of any third party. The participant can submit in common file types such as PNG/JPG/PDF formats. Entries of scanned or photographed hand-drawn works will not be accepted. All submitted entries will not be returned. The participants are advised to maintain a copy of their submissions to prevent from encountering any unanticipated loss or damage. The Participant warrants to provide the Organizers with editable digital files of the winning entries after the Contest. The winning entries become the property of the Organizers and may be used for communication and promotional purposes both during and after the Contest without notice and without payment or attribution for promotions. 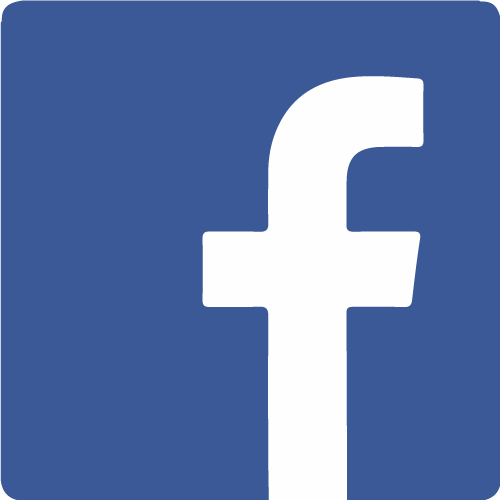 The participants agree to assume full responsibility for any damage caused to their devices, any programs, data or information related to or arising from the download of the illustration image. The Contest will only accept entries submitted between 4 March (from 00:00) to 15 March 2019 (to 23:59) (Hong Kong time). The entry submission time will be based on the Organizers' record, and the Organizers’ servers will be the official clock. The Organizers will not accept any late submission. Entries being submitted via other channels or means will not be considered. Incomplete application form and submission will mean disqualification. The Organizers will not consider/be responsible for entries that are in incorrect format/received late/corrupt/lost/non-recognizing/error due to network problems, connection failures or any technical reasons. Decision of the judging panel will determine winners of the Champion and Merit Awards. The Organizers may change the composition of the judging panel without prior notice. Participants shall raise no objection. All prizes given out by the Organizers are non-transferable and winners may not refund or exchange the prize for cash or other service(s). All winners have to collect the prizes in person. In the event that a winner is unable to claim the prize in person, he/she may authorize a delegate to claim the prize on his/her behalf. The Organizers reserve the full discretions including the right to change or cancel the prizes without prior notice. All participants who submit entries to the Contest agree to assign the intellectual property rights of their works to the Organizers. Each participant consents to granting a perpetual, royalty free, unconditional use and reproduction rights of his/her submission(s) to the Organizers. The Organizers will have the right to edit, alter, adapt, modify, publish, exhibit or deal with the entries in any manner in which they consider fit, on any date and in any venue/platform, without the consent of the creators of the winning entries. The Organizers have the right to use all or any of the entries in any format, and reserve the rights to use or allow any party to use the entries for publication, exhibition, promotion, and publicity of the Contest for non-commercial purpose at no extra cost to the respective participants. The Organizers reserve the right to make alternation to the entries for future promotion and not to use in whole or in part the entries submitted. No dispute shall be raised by the participants. All submissions must be without infringing on the Intellectual Property Right of any party. The participants shall bear full legal and related responsibilities arising from any possible breach of intellectual property rights in respect of their entries, and shall indemnify the Organizers, PolyU and other concerned parties against any claims and liabilities arising from any such breach. The Organizers shall not be responsible whether directly or indirectly for any liability arising whatsoever or howsoever from any violation of any copyright laws. The winning designs are subject to investigations regarding originality. If they do not comply with the requirement, the Organizers have the discretion to forfeit the prizes involved without any liability to the selected participants or any other persons. All participants in the Contest are on a voluntary basis. The Organizers and PolyU will be exempted from all legal liability, compensation and responsibility that may be caused by the contest and/or the prize. The Organizers and the judging panel shall not be responsible or liable for any erroneous, damaged, destroyed, lost, late, incomplete, illegible and misdirected entries, or any damage or loss arising from, connected with, or relating to the Contest, the submission of entries to the Contest, participation in the Contest, regardless of the cause, omission or any fault by the Organizers, or the judging panel or any person for whom the Organizers, or the judging panel is responsible, and notwithstanding that any of those persons may have been advised of the possibility of such loss or damage being incurred. The participant's supply of Personal Data in association with this Contest and its application form is on a voluntary basis. The participant is fully aware that the information he/she provides will be used for the purposes of (i) the administration of this Contest; (ii) communication between the Organizers and the participant; (iii) collection of opinion; (iv) statistical and analytical purposes; and (v) direct marketing of the Organizers' future activities. It may be disclosed to other departments or units within the University for one or more of the purposes specified above. The Organizers will not disclose the participant's personal data to any external body or organization unless consent is sought from the participant, and it will not be used for any other commercial purpose. If the participant wishes to access or correct personal data records as kept by the Organizers, please send an email to green.campus@polyu.edu.hk. The participant warrants that he/she is fully aware that he/she may be photographed, filmed and/or videotaped in association with the Contest as arranged by the Organizers, PolyU and/or its appointed photographer. The participant hereby irrevocably consents to and authorizes the use of his/her image, name, voice and/or opinion by the Organizers and PolyU in connection with the proper records and further publicity of this Contest. The Organizers and PolyU shall have the right to publish, distribute, adapt, reproduce, edit, display or otherwise use his/her image, name, voice and/or opinion in their publications and publicity materials where necessary, without any payment in respect of such use and prior notice. Participants will indemnify and hold harmless the Organizers from and against any and all actions, claims, proceedings, damages, losses, costs and expenses resulting from: (a) participation in the Contest; (b) any use of platform login information; (c) participants’ breach of these Contest Terms and Conditions; or (d) participants’ violation of any rights of another person or entity. Participants may require third-party software or applications to complete their entries. The Organizers do not warrant that those software or applications will be compatible or interoperable with participants’ devices or any other piece of hardware, software, equipment or device installed on or used in connection with them. The Organizers are not responsible for any delays, damages, or losses resulting from related problems.